Grilled Scallops, Tomato Salsa, Thyme for Cooking summer main course. Scallops only take a few minutes to cook They should just go from translucent to opaque. If you cook them longer they can get tough. We do ours on the barbecue grill but a hot skillet would work just as easily. Be careful not to crowd and have the pan or grill hot. They can give off a bit of liquid and you want them to brown, not steam. These are flavored with chili powder and garlic and finished with a spicy Tomato Chili Salsa. 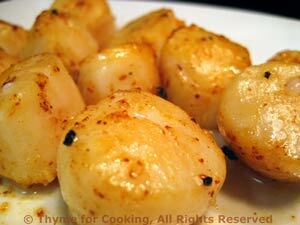 You either need to use skewers or a grill mat or pan; something to keep the scallops from falling through the grate. If using wooden skewers soak in water for a few minutes. Pour olive oil onto a large plate. Dip both sides of scallops into oil. Thread onto skewers if using. Sprinkle both sides with garlic and chili. Grill over direct heat 3 - 5 minutes per side, until they are opaque. 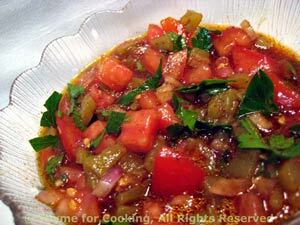 Roughly chop tomatoes, chop onion and pepper. In medium bowl whisk together dry mustard, vinegar and soy sauce. Add chili powder and whisk. Notes: Scallops could also be quickly sautéed in a nonstick skillet over medium high heat for about the same amount of time. Any leftover salsa can be eaten with chips, crackers, whatever.... I just like to have some around!